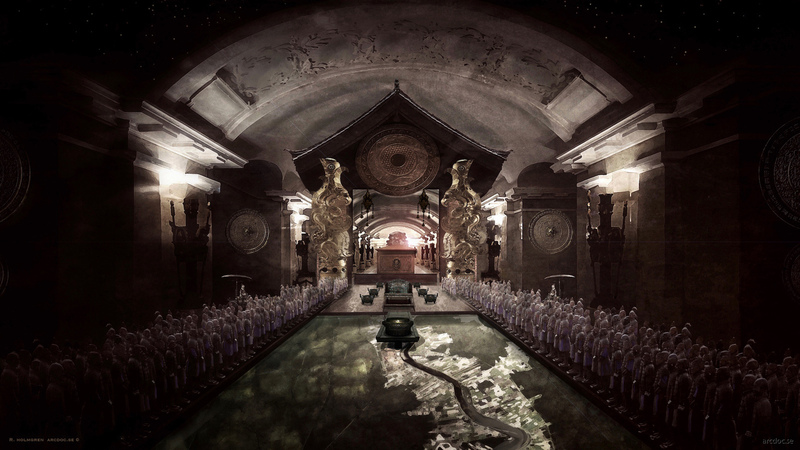 An artistic interpretation and reconstruction of Qín Shǐ Huángdì’s magnificent tomb. Illustration: Richard Holmgren, ARCDOC. His name was Zhào Zhèng. 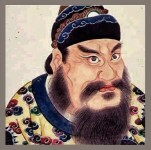 As the founder of the Qin Dynasty, we would later know him as Qín Shǐ Huángdì - the first emperor of China. At the time of his death 210 BC, he had finally united the country after defeating all of his rival states. Only one everlasting battalion remained for Huángdì – the one underground in his tomb. Fortunately for him, the now famous army of many thousands of life size terracotta soldiers gave him protection from the east. Yes, it was from that very direction that the threat of warring states would reappear. The army is still today guarding him outside the town of Xian in modern China, although his opponents have since long transformed into cities such as Shanghai. Let us reflect for a second - if such effort was put on the protection of his tomb, then what about the appearance of the mausoleum itself? It must be magnificent, right? Currently we do not know what’s hidden within, but the ancient historian Sima Qian may give us an idea what awaits below ground. The tomb complex of Qín Shǐ Huángdì is a miniature world of his palace and the entire empire. Not the least would it be right to say that the workforce that prepared his tomb was indeed a microcosm of China, where 700,000 souls were engaged in the task for over forty years. The entire grave complex of totally 55 square kilometers, mimics the nation’s foremost city of the time, Xianyang. It was enclosed by two 10 meters high, inner and outer walls. With altogether ten enormous gates, the inner perimeter had a length of about 2.5 kilometers with the exterior wall covering a total of nearly 6.5 kilometers. The entire compound also includes warriors, horses and wagons, an imperial palace, acrobats, civil servants and plethora of bronze animals. You name it. It just goes on and on and this have kept archaeologists and restorers busy since the first discovery in 1974. The mausoleum itself is expected to lie in the south-western part of the inner city - within that, the giant sarcophagus is likely located centrally in a specially adapted burial hall of about 50x80 meters. In other words, we know very well where the tomb is located. But, not so fast. The bronze sarcophagus described by Sima Qian is buried deep - more specifically "under three layers of groundwater ", although seemingly provided with a drainage systems. Above ground level a 60-meter-high burial mound is positioned. With sides of 350 meters each, the peak can be likened with a truncated pyramid which originally may have had twice the height. Considering Sima Qian's ensuing description we understand the importance of why the sepulcher was made nearly inaccessible. The tomb itself was provided with palaces and beautiful pavilions and furthermore crammed with exotic objects and wonderful treasures. Craftsmen had also constructed crossbows - aimed and ready to shoot at anyone who entered the grave. Additionally, we encounter descriptions of mechanical constructions that could simulate running rivers through means of flowing mercury. According to the historical account both the currents of the Yangtze- and the Yellow River, besides the tide of the "Great Sea", were recreated. Alongside the bodies of water are rendered landscapes, represented under stars and planets in various celestial constellations. The latter were made of jewels and gemstones, reflecting their glow from the ceiling. If these were to shimmer, light was needed - and there was. This was generated through lamps that were fueled with a special fuel, probably whale oil, which could burn for a very - a very long time. Still today the large mound suffers from high concentrations of mercury. Obviously Sima Qian’s account wasn’t a fable and thus archaeologists should keep certain crossbows in mind. The message was sent, it will be pulished soon.